Researchers believe the chemistry of bipolar disorder might lie in the chemical reactions of the brain. Bipolar disorder is a mood disorder that brings about abnormalities in behavior and the patient suffers from euphoric as well as excessive depressive phases. Although there is no solid evidence regarding this and research is still ongoing, scientists believe that the brain of people with bipolar disorder have a greater quantity of signal-sending brain cells. Human beings without the disorder also have these cells but it is about 30% less than that of people with the illness. The American Journal of Psychiatry published this difference in brain cells in October 2000. The study was conducted to devise better and effective methods of treatment of bipolar disorder. According to the scientists, the brain of people with the illness function differently resulting in cyclic phases of mania and depression. The common techniques used for understanding the chemistry of bipolar disorder consists of brain imaging techniques. Positron emission tomography and functional MRI are 2 common methods used by doctors. The nerve cells in the brain are connected with each other and form networks of their own. These cells interact within their networks and trigger various kinds of behavior in human beings. Normal and abnormal behavior is produced due to the interaction of these brain cells. Researchers believe that patients have certain differences in the brain cell structure and due to the difference in the interaction levels of the brain cells, such extremes of emotions can be noticed. Various kinds of brain chemicals called monoamines are released by the brain cells. Neurons or brain cells are responsible for transmitting the signals sent by chemicals like serotonin, dopamine and norepinephrine. Studies have revealed that the density of neurons producing the monoamines differ between normal people and patients of bipolar disorder. The positron emission tomography scan can give a clear idea about the density of the brain cells and studies have revealed that excessive amount of the monoamine producing cells actually influence the social and cognitive functioning of a patient. 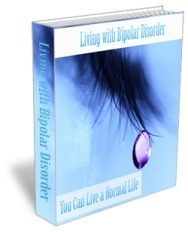 The causes of bipolar disorder range from biological to genetic factors and scientists therefore have to take into account other factors as well while researching on the causes of the disorder. However, recent studies have revealed that the chemistry of bipolar disorder lies in the chemical reactions of the brain cells. Scientists believe this is only a rough beginning to an extensive study and they can only formulate ideas about what might be going on within the brain of patients. Further study can help in gathering additional information about the exact chemistry of bipolar disorder and how to control it.